It’s a big word but a small plant. Garcinia cambogia is an Indian fruit that looks like a tiny pumpkin. Hydroxycitric acid can be extracted from both its inner flesh and rind, and is used in a number of marketed weight loss products. 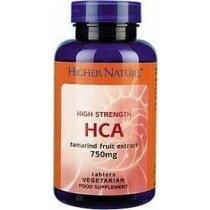 Hydroxycitric acid claims to dramatically reduce the appetite and help the body burn fat at an accelerated rate. There are no human research trials that have shown results to support these claims however.